On the occasion of the 33rd edition of one of the most influential exhibitions in the world AMUT GROUP will be introducing the technologies lately developed by each Division. Chinaplas will be held at Guangzhou from the 21st to the 24th of May. The new washing plant has been purposely developed by AMUT experts to cope with the necessity of processing very dirty PET post-consumer landfill collected bottles. On December 2018 a cooperation agreement has been signed between Mr. Jordi Sala i Lladó, CEO of BIANNA RECYCLING and Mr. Mauro Drappo, CEO of AMUT GROUP. It is a long term business partnership, worthwhile for both, established to blend values and performances of two well consolidated companies. The ever-increasing awareness on the Russian territory of considering post-consume materials as a resource has lead AMUT ECOTECH, Green Division of AMUT GROUP, to take part to the “Waste Treatment Conference” organized by INVENTRA (CREON Group) on the 22nd of October, in Moscow. AMUT GROUP is a leading Italian reality that manufactures extrusion and thermoforming tailored lines to process polymers for flexible or rigid products, washing plants for plastic items and sorting equipment for household and industrial waste. Flexo machines are also provided. The supply includes: three co-ex lines for blown PE shrink film, one cast line for stretch film, one slitting machine, a system for the recovery of flawed rolls, chiller, piping for water distribution plus an intensive training programme for GEPP technicians. New accessories have been specifically conceived to suit ACF model mainly to cover the end-line automation steps. During the month of October, at the AMUT Open House Hall in Novara, the brand new flexo gearless machine, TELIA 8 FSC model, will be in demo show and available for personalized tests on demand. AMUT DOLCI EXTRUSION has recently supplied to EB Packaging SDN. BHD a cast line for the production of stretch film for the factory located in Batu Pahat, Johor, Malaysia. The line is 2000 mm-wide for film configuration in 7 layers. The brand new AMUT DOLCI EXTRUSION line, supplied to an European customer, will produce PA-PE film to be converted into vacuum pouches/envelopes or trays for sliced foodstuff. The conveyor belt receives the items from the thermoforming machine at an adjustable height and down to a level of 800 mm. With AMUT washing technology, Ferrarelle will produce up to 3.000 kg/h of flakes recycled from post-consumer PET bottles and will use flakes suitable for food application thanks to a re-gradation process. In September 2018 the world’s first facility for POAL recycling will be in operation to produce Ecoallene. POAL is a polyethylene + aluminium polycomposite recovered from food packaging. Closing the loop motto - three players for a green planet: GLOBAL PLASTICS, HICKMAN’S FAMILYF ARMS and AMUT GROUP. Forward-thinking companies who have started a great vertical collaboration to give to plastic a second life, avoiding post-consumer bottles to end up in landfills or in the ocean. The newly added line supplied by AMUT produces waterproofing membranes in TPO reaching anoutpu t of 2.200 kg/h, around 7 million square meters, annually. The maximum width is 2.000 mm. This line is quite unique because it delivers 3-layer reinforced membrane with a single calender system. AMUT and EREMA invite guests to experience the closed material loop of PET first-hand from 28 to 31 May 2018. Washed post-consumer PET bottle flakes will be recycled live at the AMUT headquarters in Novara, Italy, to make food contact grade thermoforming sheet in a direct process. This rPET sheet will be used at the Plast Milan exhibition – which is being held at the same time – to make thermoformed trays for the food sector. AMUT GROUP specialists will welcome you offering assistance also in the other divisions: Thermoforming machines (in-line and off-line solutions), Extrusion lines for rigid products (such as sheets, membranes, profiles, pipes) and Recycling – washing plants for PET and PE items. This line, 2100 mm width, has been specifically designed for the production of film with smooth surface for general purposes and for the production of film with embossed surface for stationery applications, such as folders for documents. “We had such a good first impression of AMUT GROUP technology that we decided to put our confidence in the Italian company buying in one single step four extrusion lines for the production of pipes" – stated Mr. James Henshaw, CEO of CHIP MONG INDUSTRIES. “We are glad to have scored another top reference in the Northern America plastic recycling market. The CarbonLITE PET recycling project comes after the two mega PET recycling plants that AMUT supplied in North America to UNIFI in Reidsville, North Carolina, and to PETSTAR Coca-Cola Mexico” stated Mr. Piergianni Milani, the President of AMUT GROUP. The operation fulfills the integration process of the “Flexible Packaging Equipment Division” and the “Flexo Printing and Converting Equipment Division” into the AMUT GROUP, increasing effective synergy and efficiency to serve Customers all around the world. custom-tailored lines for processing plastic materials. On the 3rd of November, AMUT GROUP hosted in its headquarter in Novara, Italy, a delegation consisting of top Chinese producers of Waterproofing Membranes in Bitumen and Polymers, with the intention to present the latest extrusion technologies in this field. AMUT GROUP is already worldwide leader, with few installations also in the Chinese territory. AMUT GROUP Recycling Division will present its state-of-the-art range of washing plants for the treatment of PET, HDPE and PP plastics and urban and industrial waste sorting equipment. The complex of the plants will be well represented by two typical machines: TURBO WASHER and BALLISTIC SEPARATOR - MPC MODEL. AMUT DOLCI BIELLONI has decided to design and integrate in all the high speed lines our Roll Pack 4.0 Packaging System, which is now an accessory of our PRO-WIND winders and can pack any finished roll. The water-saving concept of the AMUT patented technologies are well known all around the world because of the treated water that can be re-used thanks to special recirculation circuits. Speed, accuracy and reliability: these are the three key factors that distinguish the new stacking robot series supplied with the ACF thermoforming machines. Chinaplas is the consolidation of our good reputation as manufacturer with 100% Italian technology and quality. AMUT ECOTECH, Recycling Division of AMUT GROUP, has supplied for Minya Governorate a municipal solid waste recycling facility for the best management of recyclable materials. 8 colours, 140 cm web width, printing repeat up to 90 cm, speed up to 500 m/min. The downtimes in the job-changing phase have been substantially reduced. AMUT GROUP has recently supplied to P.T. Starplast Packaging Industry a complete in-line thermoforming plant to produce disposable PP cups for cold tea. 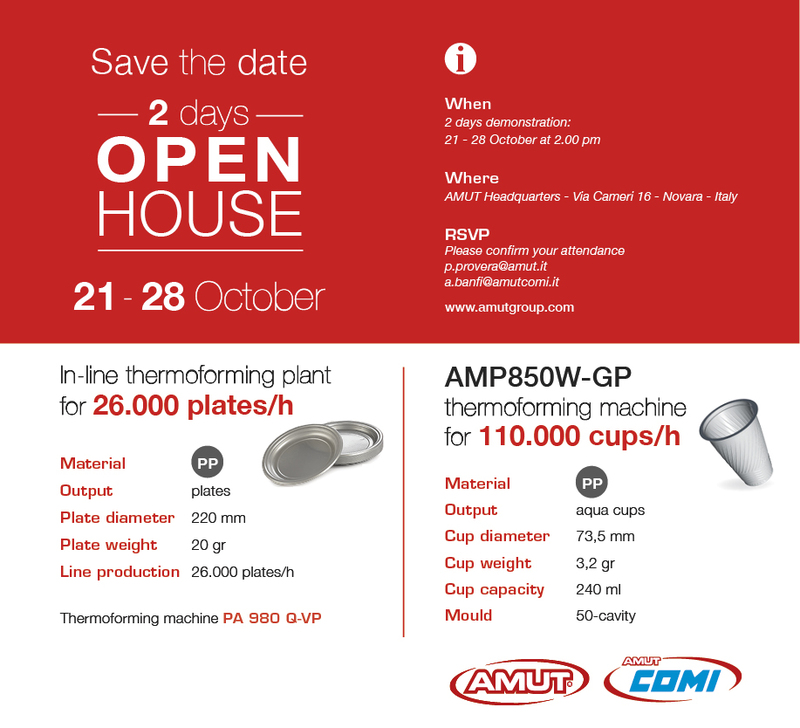 AMUT COMI will exhibit an off-line thermoforming machine, model AMP 850-GP, complete of a mould for vending coffee cups. The technology applied is single station. The web is produced with a Double-Stage Co-Extrusion Coating/Laminating Line, where paperboard is replaced by Bi-oriented & Primerized Film and where there is NO need of the Third Stage section. AMUT COMI embraces also the South East Asian market presenting the ACF 820 model in operation during Chinaplas exhibition. K 2016 turned again into a great event for AMUT GROUP who has once more impressively catch the interest of hundreds international customers. The “EXTRU-CONVERT” factory at the Fair. At booth 16-A-05, AMUT DOLCI BIELLONI will show in operation an updated technology with clever solutions. During K Show in Dusseldorf, AMUT COMI will present in operation a new generation of thermoforming machines, the ACF series. Hall 03 - Stand n. E40. Telia FSC is the fastest system for job changeovers and the only one capable of granting less than 7 meters of waste material when changing two eight colours jobs. Diameter up to 630 mm for the production of multilayer-pipes in PP with glass fiber: this is the line sold by AMUT to a primary European pipe producer dedicated to hot and cold water ducting for civil and industrial applications. The extruders range from a minimum diameter of 48 mm L/D35 up to 160 mm L/D35. The performances are rather unique, the energy saving is around 20-25%. The Telia 8 colours includes a new and an improved version of the FSC system. The unwinders/rewinders, totally new in the design, are shaftless. 3 LAYER BLOWN FILM LINE FOR TECHNICAL FILMS. The output of the line can easily reach 600 Kg/hour in continuous production. Extreme tight gauge tolerance (below 2% for some kind of products). We inform all our customers that a NEW 2 METERS 3 LAYERS COEX LINE will be shown in operation in the second half of April. The corrugated PVC sheet produced with AMUT lines can have different geometries and a thickness range from 0.8 up to 2.0 mm. The extruders are twinscrew type, series BA. AMUT GROUP does not miss the opportunity to exhibit at Propak Vietnam and Chinaplas - Shanghai: these fairs represent a good occasion to finalize some running contracts and to meet new potential customers in these booming countries. AMUT continues to improve the technology of lines producing PP pipes with glass fibres and mineral filler (calcium carbonate or barium sulphate). The pipes extruded with this technology are used for hot water piping and soundproofing drainage piping. “We are very glad to open the door to international worthy students and sharing our company reality to them. We’re always content to help to reduce the gap between university study-experience and practical manufacturing trial” . AMUT manufactures extrusion lines producing waterproofing membranes capable to process different thermoplastic materials, such as F/PVC, TPO, TPE. On all our 5-7-9 layers lines, either for technical films or for barrier films, we include: the pancake stackable die. Dow and AMUT DOLCI BIELLONI for a joint open house in Biassono, Italy. The NET PRODUCTION of the line is 1400 Kg/hour (finished rolls). The PRODUCTION SPEED is 600 m/min. WHY CHOOSE A TELIA GEARLESS FLEXOPRESS? AMP850W-GP thermoforming machine for 110.000 cups/h. The 3-layer co-extrusion technology is now commonly accepted by the market because it has been proven that, better mechanical properties on the film are achieved by splitting the melt into 3 layers. We are proud to announce that the new 2-station winders ACP 2000 and ACP 3000 have achieved remarkable and unique results in production. We decided this important investment in order to put the lines at full disposal of our Customers to run specific trials and to test new products and film structures. Since August 2015, AMUT GROUP confirms the establishment of new technical service points in Vietnam and Indonesia boosting and consolidating a complete onsite support to the existing and potential customers. Unifi Inc. selected equipment makers AMUT SpA to provide the technology for a $25 million expansion that will increase its capacity to turn PET bottles into recycled fibers for apparel and automotive products. The investment is being made at Unifi’s facility in Reidsville, N.C.
EVA, Ethylene-Vinyl-Acetate, is the type of material produced with AMUT’s extrusion foil line and it is especially reserved for the production of solar-photovoltaic panels. The long-time experience of AMUT in the production of extruders has marked a sweeping change in the conventional extrusion concept of stretch film cast lines manufacturing: during the last Open House in May, the customers have testified a constant production speed of 750 m/min. The University of Pisa, Engineering Department, has chosen AMUT as partner to cooperate on four research projects sponsored by the European Community, specific on dealing the study of plastic materials processing. During the Plast fair that will take place from the 5th to the 9th of May in Milan, will be show the progress of AMUT DOLCI BIELLONI technologies: three cast, one blown film line and a flexo gearless machine in operation in Biassono factory, which is only 25 minutes far from the fairground. AMUT DOLCI BIELLONI will show in Open House during the next PLAST Exhibition (Milano 5 - 9 May 2015) its most updated Blown Film line for the production of quality films designed for an output of 750 Kg/hour. The line has been developed for the production of rolls of “SUPERPOWER” film for high speed wrapping machines, but can also be used for the production of hand rolls in very thin gauges (6 my) and 200 m in length. During the Plast show in Milano (5-9-May 2015) AMUT DOLCI BIELLONI will introduce the Telia FSC 10 colour flexo gearless press and will organize live demos on how the machine « repeats » the printing pressures (when changing a job) without any electronic additional equipment. During the next international Plast show in Milano (5 to 9 May) we will show in operation a new stretch film line that includes the “Multiwind” winder for the production of jumbo, machine and hand rolls. During Plast Exhibition in Milan, SAIP will be guest at AMUT GROUP’s booth to seal the recent technical collaboration in manufacturing lines for the production of PIPE IN PIPE technology. AMUT GROUP is ready for the triennial Plast Exhibition held in Milan with an impressive booth of more than 800 m² to officialise in the European scenario the new settled AMUT DOLCI BIELLONI and to display the latest developments in extrusion, recycling and thermoforming field. All visitors will see the new model of thermoforming machine AMP850W-GP in operation. “Taking over DOLCI BIELLONI company is a brilliant success for the future of AMUT GROUP: together we boost our leading role in the international scenario. Synergies enhance our strengths” – says Mauro Drappo, CEO of AMUT GROUP. At Chinaplas AMUT GROUP presents in operation the VPK-C84 automatic thermoforming machine producing rigid packaging, such as trays, punnets, containers. “The European Business Awards is one of the most highly regarded business competitions in the world attracting significant media interest and involving several successfully companies. We are glad to have passed the entry selection and can progress through the further steps” – says Mr Piergianni Milani, President of AMUT. AMUT has successfully tested and delivered to a large North American producer a complete in-line thermoforming plant for the production of disposable cups (size required by the USA and Canadian markets). AMUT Recycling Division, innovative manufacturer of plastics washing plants, together with AMUT ECOTECH, high expert of sorting and separation technology, represent an instrumental player in the waste processing systems field. AMUT and AMUT ECOTECH become a sole reference to supply recycling facilities. The HDPE dimpled sheet is largely used to protect and provide drainage for the underground walls and it is the latest solution for the proper protection and ventilation of the waterproofing mantle between cement foundations and ground. Furthermore, its versatility makes it essential for the realization of buildings in zones where water presence is particularly high. C.Lic.Enrique Peña Nieto, the President of Mexico, the Board of Directors of Petstar and Coca-Cola Management participated in the opening ceremony held at Pet Star premises at Toluca, Mexico, on the 16th of July. The latest PET wash plant installed by AMUT has been shown to the large number of guests including top level managers involved in PET recycling business. AMUT has lately supplied to Poly Er, one of the biggest Russian thermoformers, the first in line thermoforming machine producing disposable plates (in HIPS + GPPS material) with a weight of only 3 gr. AMUT is pleased to have been selected as an integral part of the new project of CarbonLITE Recycling LLC (an HCP company): a 20.000 m² plant will process post-consumer bottles into pcrPET pellets that can be used to make new bottles. Since 1958 AMUT, headquartered in Novara - Italy, is a global leader in the plastics extrusion field and manufactures different lines configurations to extrude pipes, offering solutions for several materials and diameters. 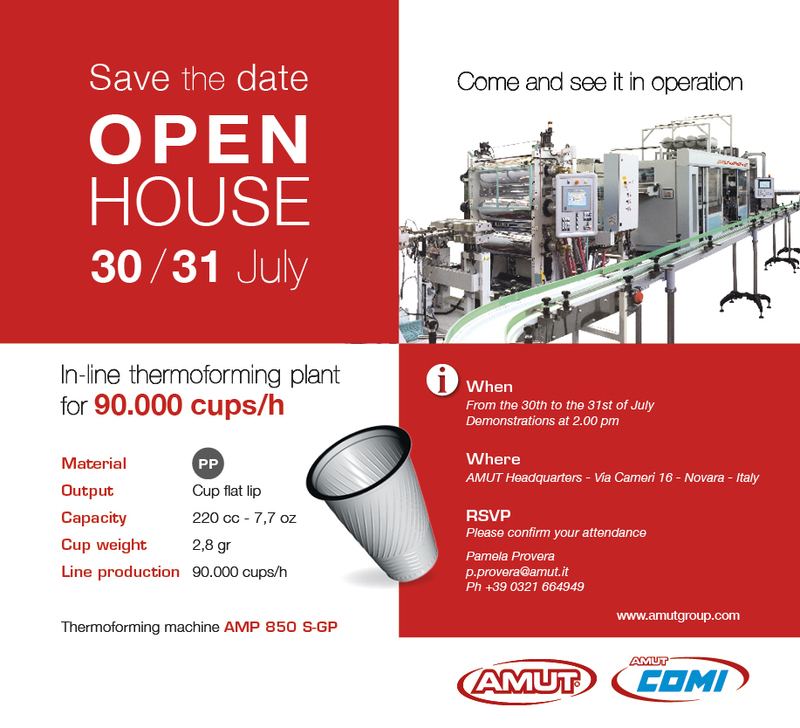 AMUT COMI, member of AMUT GROUP, is a 100% Italian company result of the cooperation between AMUT and COMI merging their technological know-how in thermoforming field. Strongly trusting on South America continuous growth, this year also, AMUT GROUP will be exhibitor at Argenplas in Buenos Aires, showing its range of products and presenting its recent structure as Group. AMUT Recycling Division has successfully started up a new MINI PRF at Wellman’s in Johnsonville, South Carolina, with a capacity of 6÷7 tons/h (14,000 lbs/h). The AMUT ballistic separator is the first model mounted on flat-bed trailer, feature which represents a great improvement because it enables a complete flexibility: SBS 201 can be added or easy-fit to every existing lines. AMUT GROUP, headquartered in Novara, Italy, is a global leader in plastics extrusion field, since 1958. Starting with the production of different kind of extruders, the company has continued its technological improvement up to manufacturing complete lines. After supplying some machines throughout Asia, AMUT GROUP has also gained confidence in Vietnam market, consolidating its strength with the full time presence of the Sales Manager Mr Andrea Peretto, in charge of the area. AMP 630-GP second generation is the model set up and destined to be the first, for typology, extrusion and termoforming plant “in line” with high capacity installed into the south-Vietnamese market.